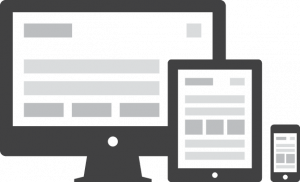 Mobile usability was a hot topic in website design area for couple of years now. Various approaches and solutions exists to cover web for emerging mobile technologies and a widespread use of mobile devices (smartphones, tablets, phone + tablets = “phablets” etc.) 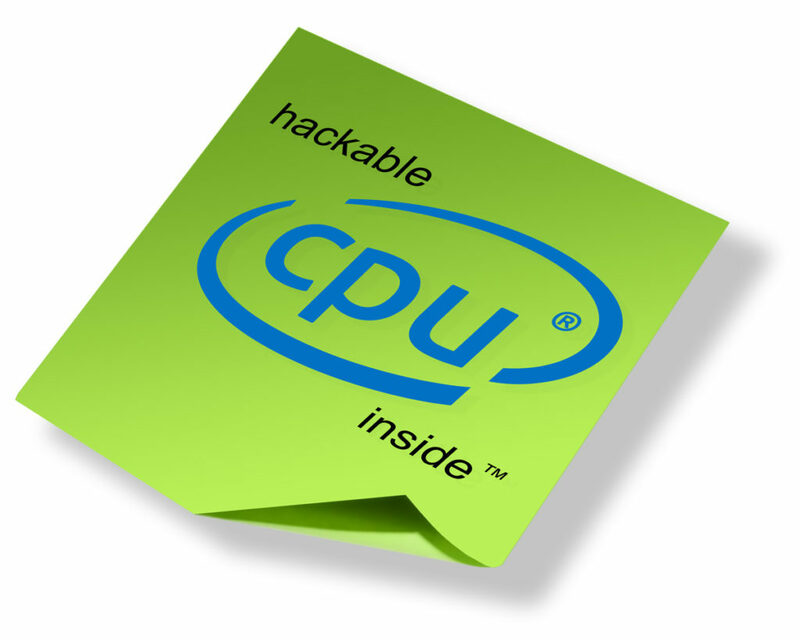 Today laptop computers are almost considered as “desktop” machines and belong to semi-mobile platforms. WHAT DOES THIS UPDATE MEANS? 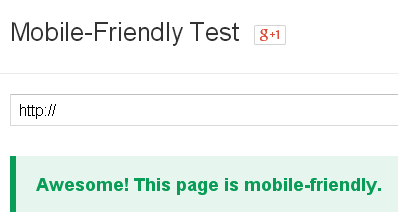 In one line: Mobile-Friendly websites get a ranking boost in Google search results! This means that if a user searches for something on his/hers phone, the top results will be from the websites that have a content adjusted to the smaller screen sizes of the device itself. For example, Website A (from Company A) is much more popular and older than Website B (from Company B) and normally, it will pop-up at the very top in search for a given query. However, Company A has not invested in it’s website redesign and server old non-responsive pages to our visitor, who then needs to zoom and pan/scroll for the information it was looking for. On the other hand, Company B has a modern website design built with latest technologies and that fact alone will give it the edge over the competition. And, finally, instead of showing up below or later pages, it will be shown at the very top, ahead the much popular and older Website A. Good news is that this is a selective update. If, for any reason, you keep some pages non-responsive (either due personal or technical reasons), your website will not be affected globally. 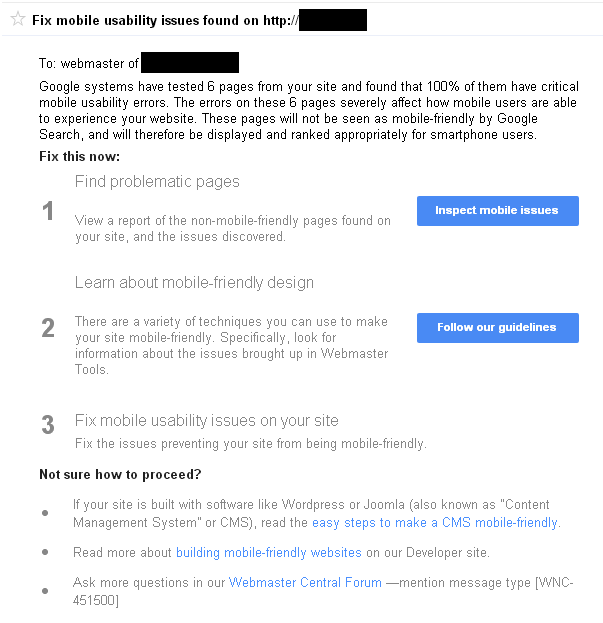 Google systems have tested 6 pages from your site and found that 100% of them have critical mobile usability errors. 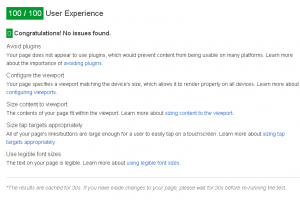 The errors on these 6 pages severely affect how mobile users are able to experience your website. These pages will not be seen as mobile-friendly by Google Search, and will therefore be displayed and ranked appropriately for smartphone users. The website in question was several years old (since 2012) and was enjoying a decent popularity and ranking in its field. However, after the mobile-friendly update a decline in mobile traffic was noticed and — when I ‘ve performed some common search queries it slipped from page 1 results #1 spot to page 2 #17 place in matter of weeks! This event has set our alarm bells and required an immediate action: convert the website to responsive design. Frankly, I was not in a hurry simply because didn’t believe that this update was going to affect things so fast. Apparently it did. For most websites the only real solution is to completely re-design your entire CSS and some portions of HTML code if necessary. Of course, for CMS themes you need to move some other stuff around, like PHP code as well. 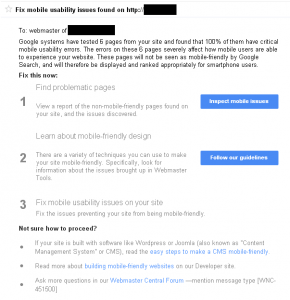 However, for simpler non-CMS mostly static websites — a temporary quick solution would be to set-up a redirect that will catch mobile devices and point them to simpler, mobile-friendly versions. 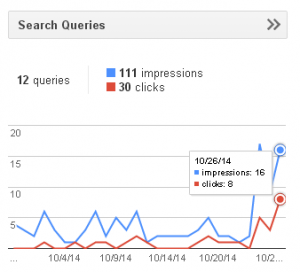 301 redirects are followed by Google (they pass PageRank value) and will receive at least some traffic. In fact, this was indeed a first thing that we’ve done for the above simple website and just after few days it got listed on the top of the search results! (other pages were ignored, and listed on later pages). The downside of this solution is obviously the 301 redirect. 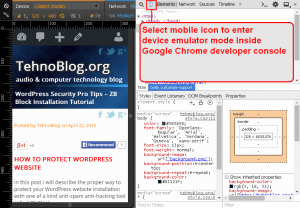 I had to develop special PHP code and cookies, to avoid constant redirect loop of our visitors once they click on “show full version” button in mobile version of the site. That was a small complication that was easily solved, but ultimately far from simplicity and clean solution. 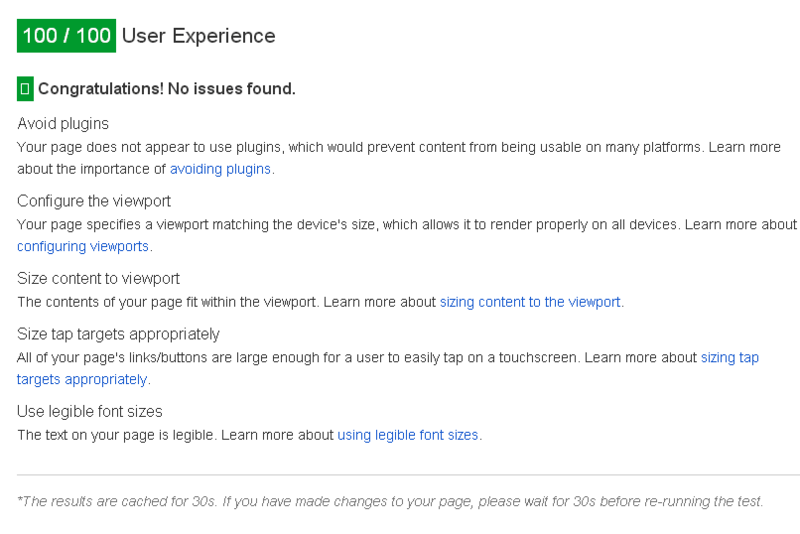 Not to mention the fact that most users do not like crippled mobile-friendly versions anyway. After few weeks, when finally finished the responsive design conversion, and Google’s search took some time to pick new website up, the balance was again restored. This is a streamlined tool that will help you specifically with responsive issues and guidance for solutions. 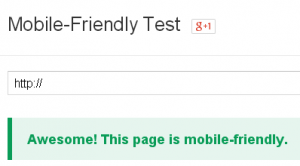 A useful link that goes with it is Google Mobile SEO Webmasters Guide. As you can see above, our website in question passed with an incredible 100/100 responsive mobile friendly score above! Of course, this is possible only for the simplest websites. 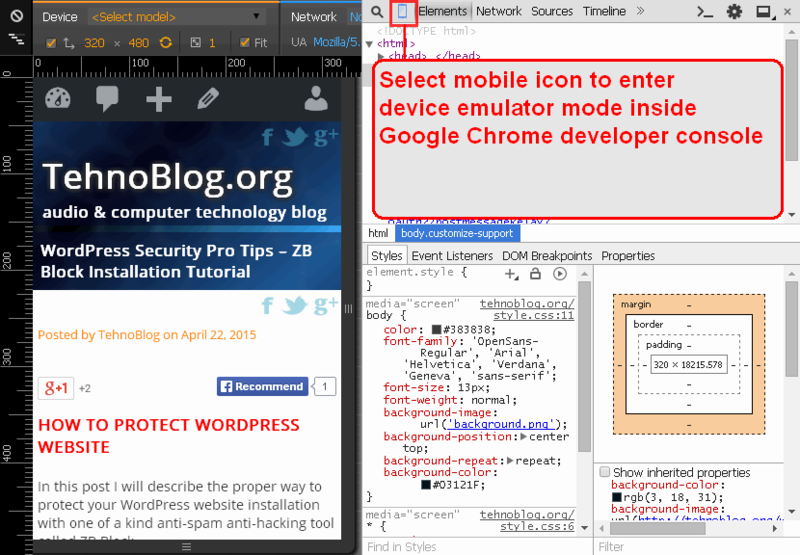 For more complex ones that rely on 3rd party widgets, plugins etc. that is a much greater challenge, because some external parts you cannot control. One very important benefit of PageSpeed is the fact that it will actually show you the exact HTML elements that fall outside viewport (actual device’s screen) that you can fix straight forward. There is one more tool that I very much like – latest Developer Console inside Google Chrome browsers (from version 40+ above). What is so special about it in comparison to similar consoles from Firefox (built-in or Firebug extension), Internet Explorer / Spartan, Maxthon etc. ? Well, for one, Chromium and Google teams advanced it way more than it is currently in other browsers. For example, auto-complete of CSS rules is more intelligent, almost as if it reads your mind. Jokes aside, I think that they have done some homework with statistical analysis of most frequently used CSS rules and configured their auto-complete feature to respond that way. The above 3 tools are invaluable and irreplaceable resources to get your website on the right mobile-friendly path! I have seen many web sites did not pass the mobile usability test but still rank #1. Why? Hi, it depends on the used search keywords – if the user specifically search for some particular website or term that is unique to that site, Google will put it on top, but without “mobile friendly” description tag.